Broad spectrum acaricide medicine against parasites. Ear drops for dogs and cats. Api-san, Dana Spot-On against fleas and ticks for dogs of large breeds. Api-San, Dana spot-on against fleas and ticks for dogs and puppies from 10kgr up to 20kgr. RolfClub 3D collar against fleas and ticks for cats. 40cm length. RolfClub 3D collar against fleas and ticks for kittens. 40cm length. RolfClub 3D collar against fleas and ticks for puppies. 40cm length. RolfClub 3D collar against fleas and ticks for dogs. 65cm length. RolfClub 3D collar against fleas and ticks for large breed dogs. 75cm length. Inspector collar for external and internal parasites for medium-sized dogs. 65cm length. Inspector collar for external and internal parasites for large breed dogs. 75cm length. Inspector insect-acaricidal drop for all parasites. For cats weighing up to 4kgr. Inspector insect-acaricidal drop for all parasites. For cats weighing from 4kgr up to 8kgr. Inspector insect-acaricidal drop for all parasites. For dogs weighing from 25kgr up to 40kgr. Inspector insect-acaricidal drop for all parasites. For dogs weighing from 10kgr up to 25kgr. Inspector insect-acaricidal drop for all parasites. For dogs weighing from 4kgr up to 10kgr. Inspector insect-acaricidal drop for all parasites. For dogs weighing up to 4kgr. RolfClub 3D drops against ticks and fleas for dogs weighing 40-60kgr. RolfClub 3D drops against ticks and fleas for dogs weighing 20-40kgr. RolfClub 3D drops against ticks and fleas for dogs weighing 10-20kgr. RolfClub 3D drops against ticks and fleas for dogs weighing 4-10kgr. RolfClub 3D drops against ticks and fleas for cats weighing over 4kgr. RolfClub 3D drops against ticks and fleas for cats weighing up to 4kgr. Inspector spray for the treatment and prevention of arachnoentomosis and nematodosis in dogs and cats, 100ml. RolfClub 3D spray against fleas and ticks for dogs, 200ml. Gelmintal Syrup for dogs over 10kg. Gelmintal Syrup for puppies and dogs up to 10kgr. Gelmintal Syrup for helminths for kittens and cats up to 4 kgr. 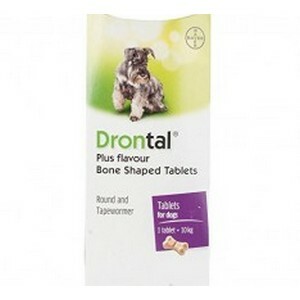 Drontal combined anti roundworm and tapeworm treatment with meat taste tablets. One tablet per 10kg of bodyweight. 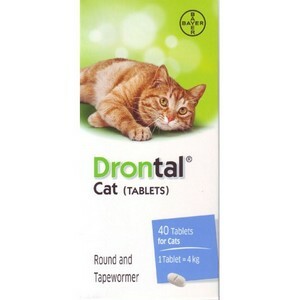 Drontal combined anti roundworm and tapeworm treatment tablets. One tablet per 4kg of bodyweight. 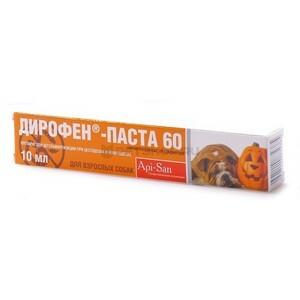 Dyrofen antiparasitic paste 60 for dogs with pumpkin oil 10ml. Dyrofen antiparasitic paste 20 for puppies with pumpkin oil 10ml. AZINOX PLUS is a universal anthelmintic.